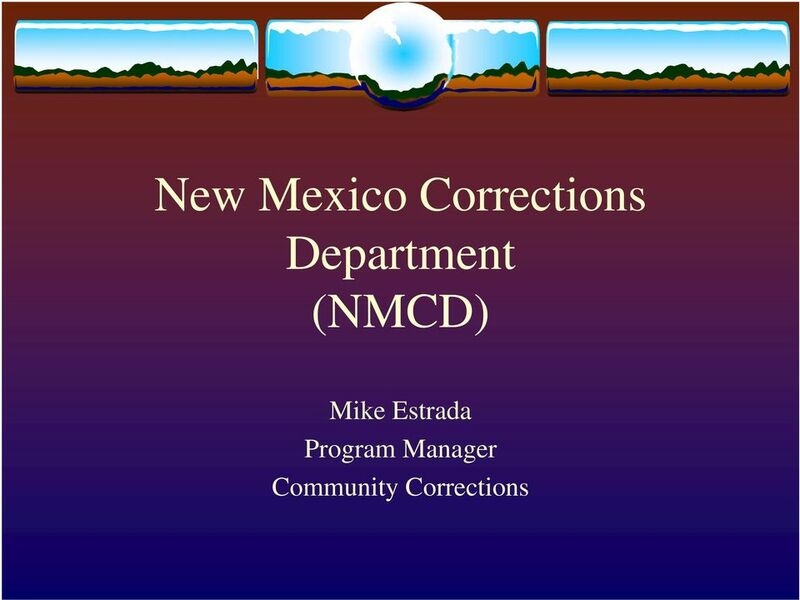 Download "New Mexico Corrections Department (NMCD) Mike Estrada Program Manager Community Corrections"
3 NMCD works with individuals convicted of state crimes. State crimes are primarily those that carry a sentence of over one (1) year. 4 What is the difference between jail and prison? 5 What is the difference between jail and prison? 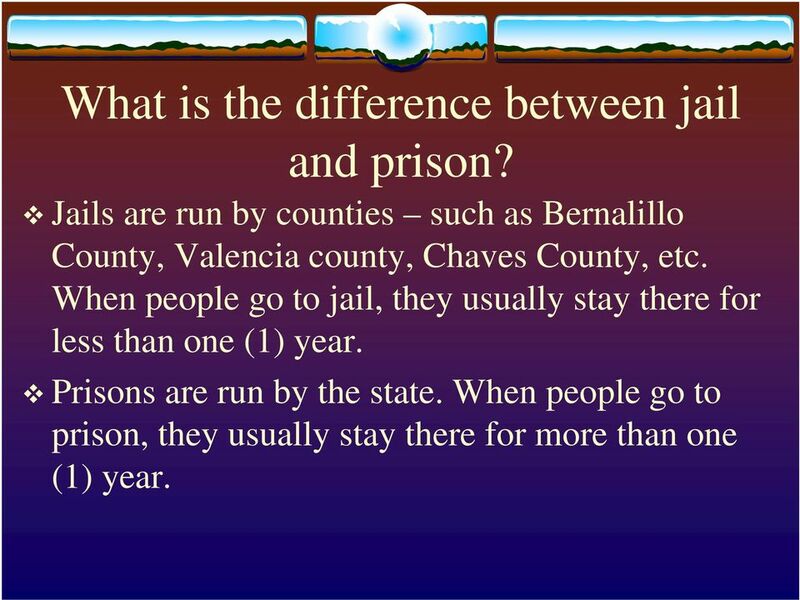 Jails are run by counties such as Bernalillo County, Valencia county, Chaves County, etc. When people go to jail, they usually stay there for less than one (1) year. 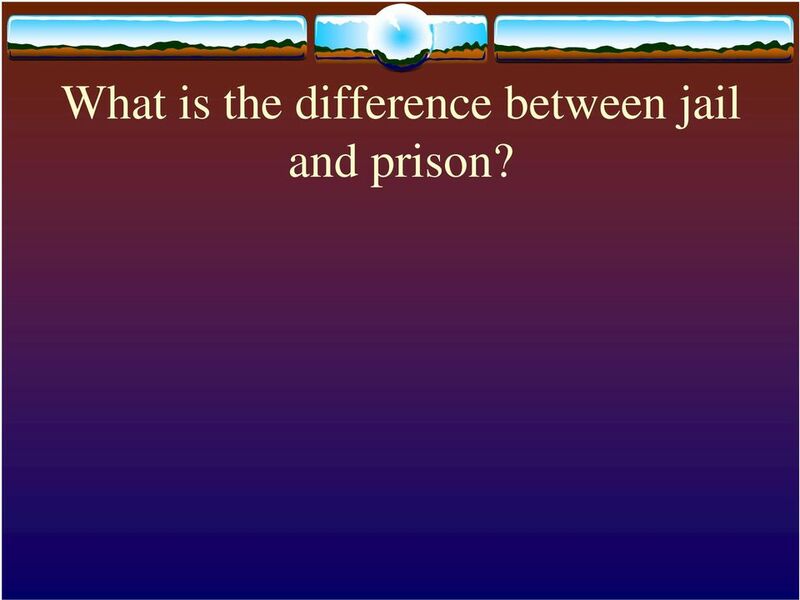 6 What is the difference between jail and prison? 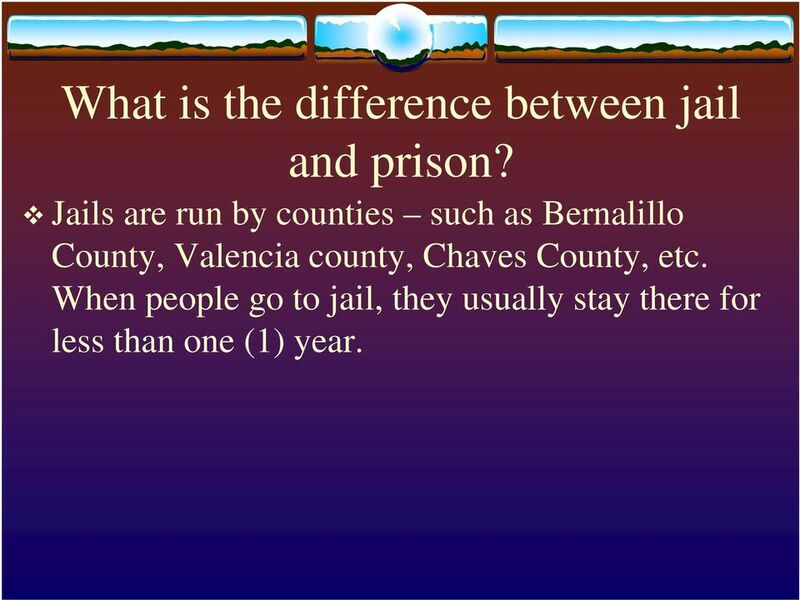 Jails are run by counties such as Bernalillo County, Valencia county, Chaves County, etc. When people go to jail, they usually stay there for less than one (1) year. Prisons are run by the state. When people go to prison, they usually stay there for more than one (1) year. 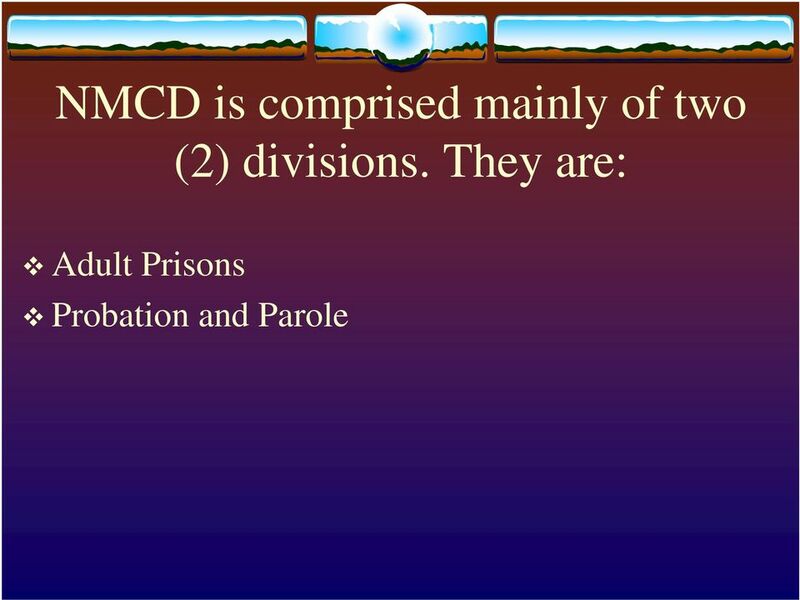 7 NMCD works with individuals who are or have been in jail or prison, and others who are on probation and/ or parole. 8 What is the difference between Probation and Parole? 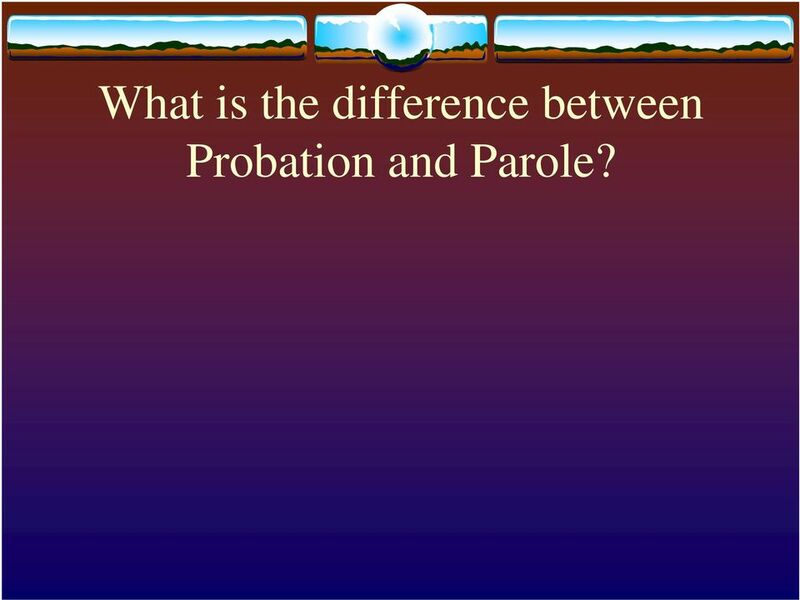 9 What is the difference between Probation and Parole? 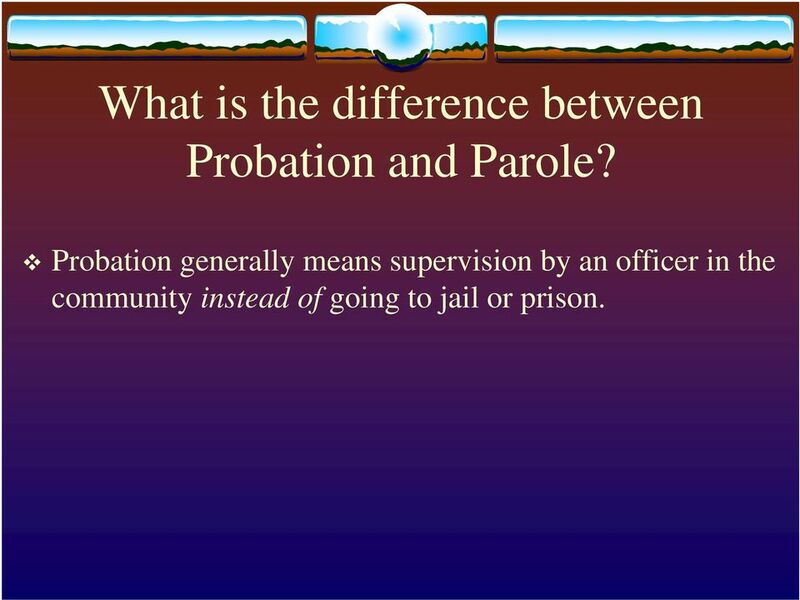 Probation generally means supervision by an officer in the community instead of going to jail or prison. 10 What is the difference between Probation and Parole? 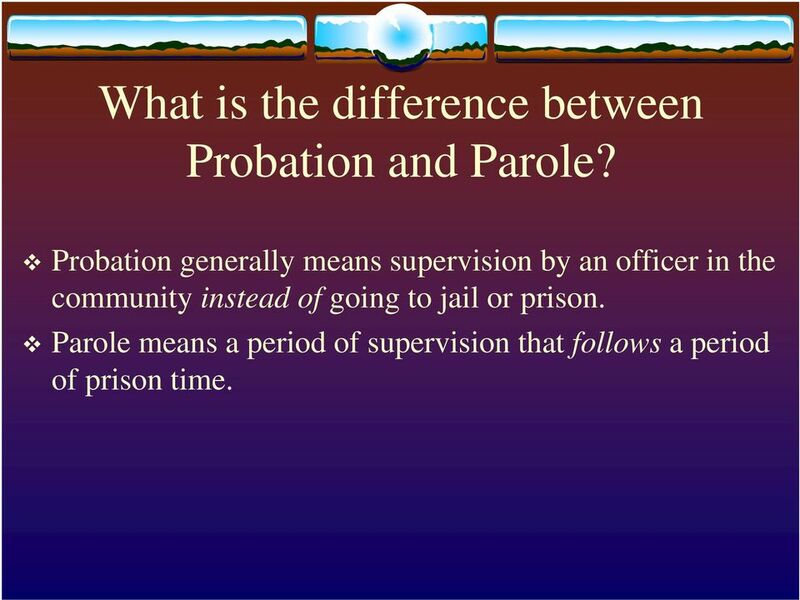 Probation generally means supervision by an officer in the community instead of going to jail or prison. Parole means a period of supervision that follows a period of prison time. 11 What is the difference between Probation and Parole? 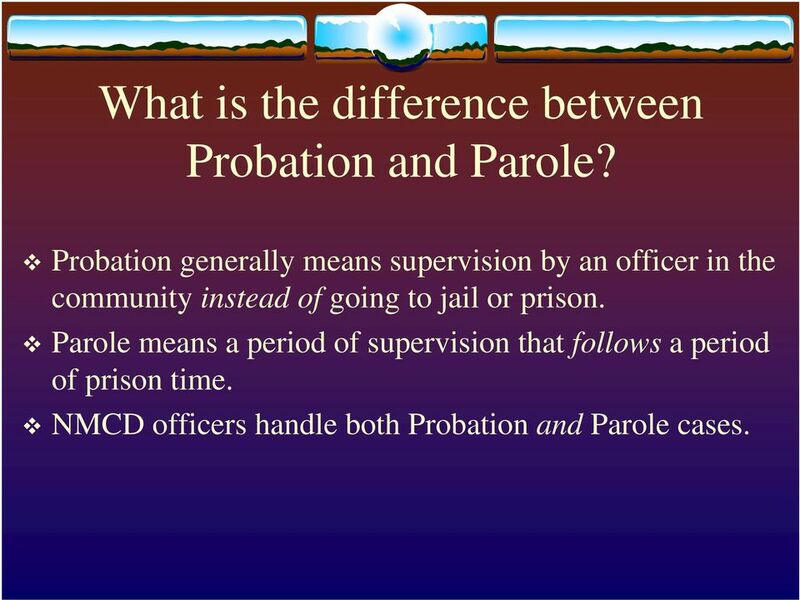 Probation generally means supervision by an officer in the community instead of going to jail or prison. Parole means a period of supervision that follows a period of prison time. 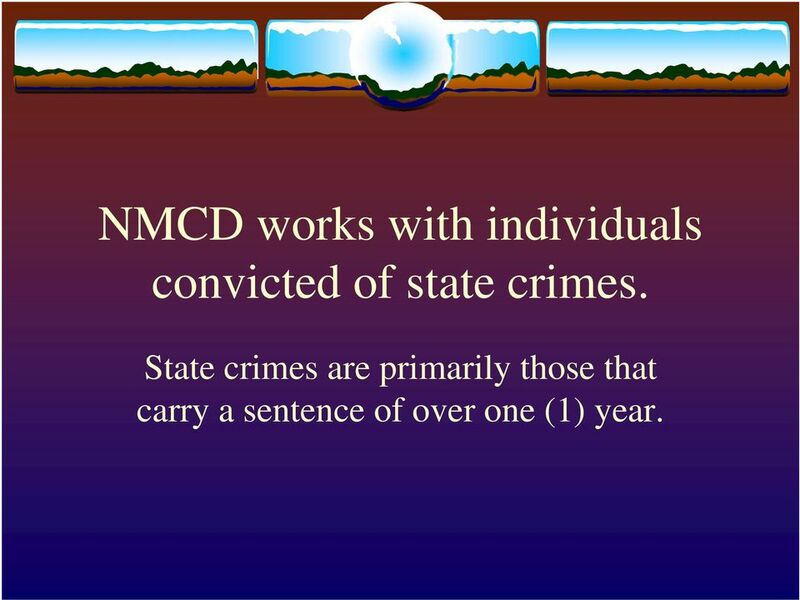 NMCD officers handle both Probation and Parole cases. 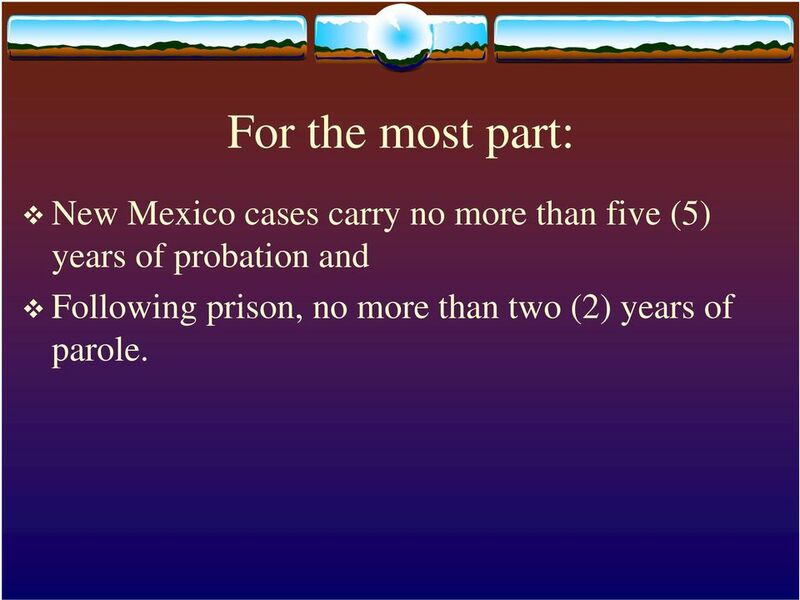 14 For the most part: New Mexico cases carry no more than five (5) years of probation and Following prison, no more than two (2) years of parole. 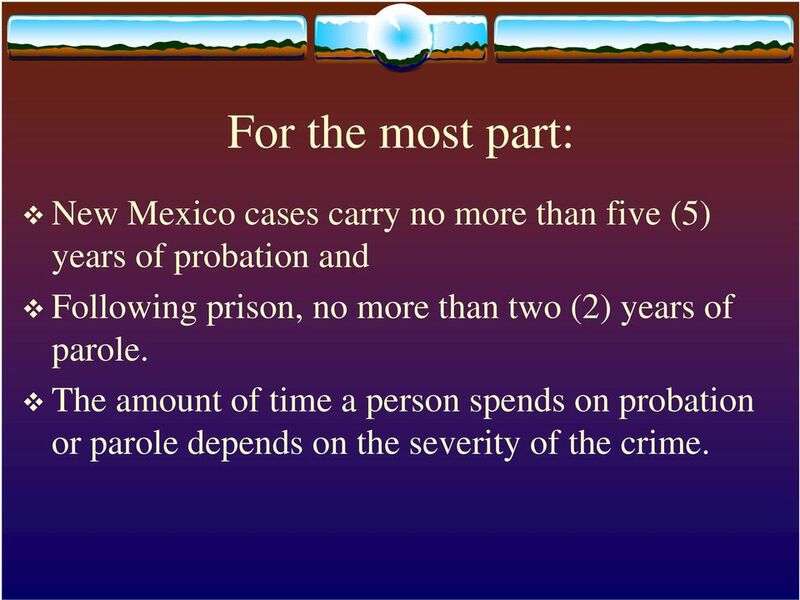 15 For the most part: New Mexico cases carry no more than five (5) years of probation and Following prison, no more than two (2) years of parole. The amount of time a person spends on probation or parole depends on the severity of the crime. 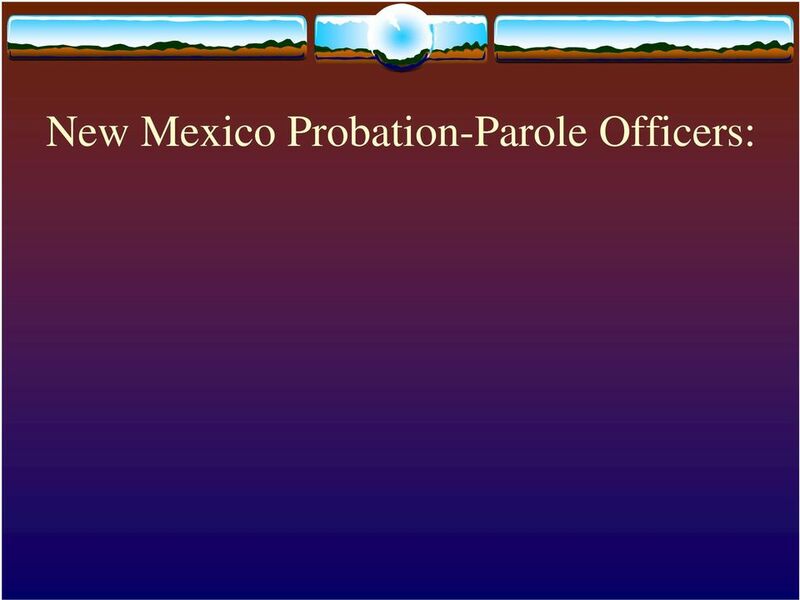 17 New Mexico Probation-Parole Officers: Provide community supervision to individuals convicted of crimes. 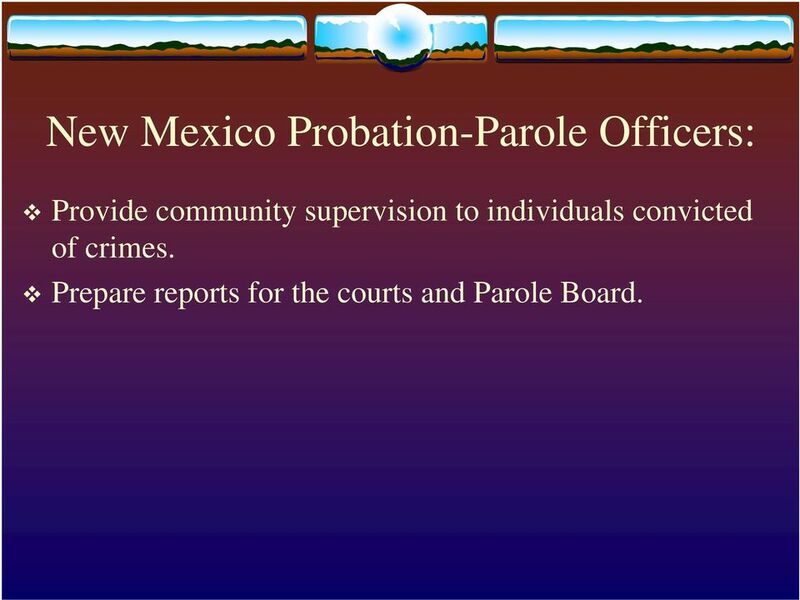 18 New Mexico Probation-Parole Officers: Provide community supervision to individuals convicted of crimes. Prepare reports for the courts and Parole Board. 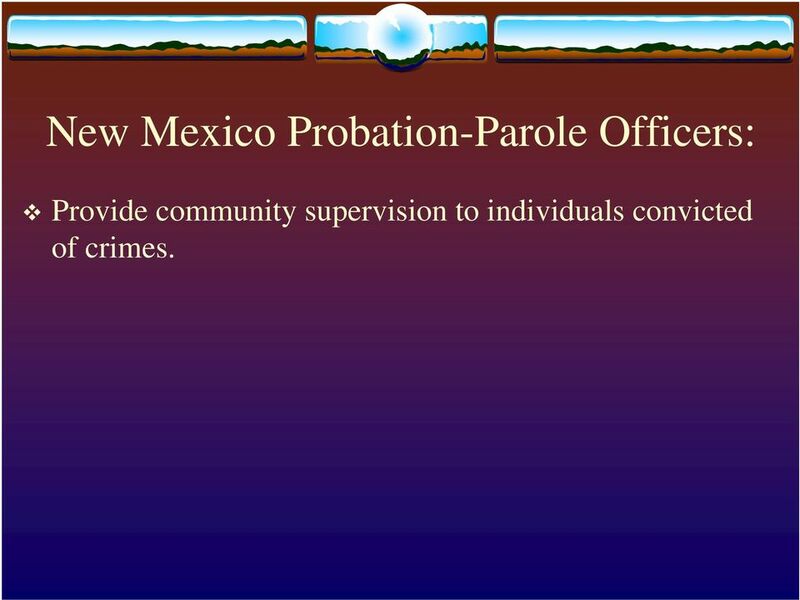 19 New Mexico Probation-Parole Officers: Provide community supervision to individuals convicted of crimes. Prepare reports for the courts and Parole Board. Testify at hearings. 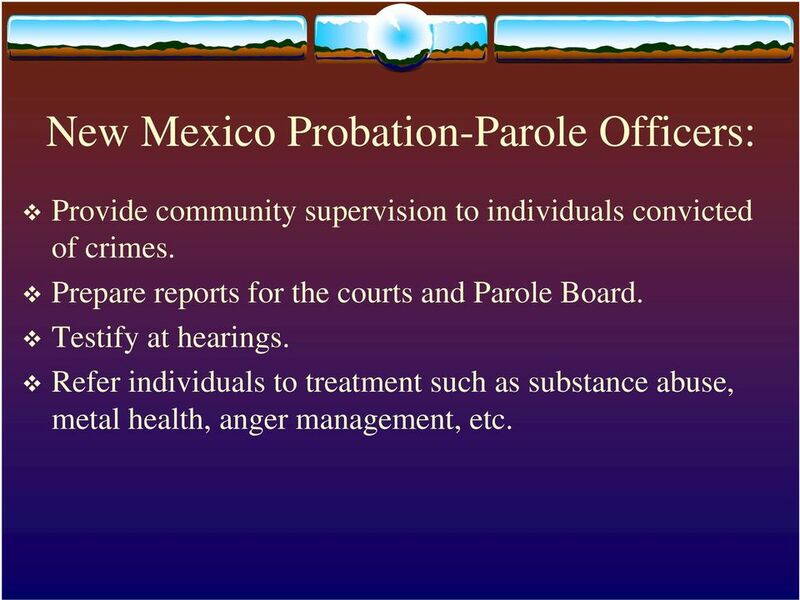 20 New Mexico Probation-Parole Officers: Provide community supervision to individuals convicted of crimes. Prepare reports for the courts and Parole Board. Testify at hearings. Refer individuals to treatment such as substance abuse, metal health, anger management, etc. 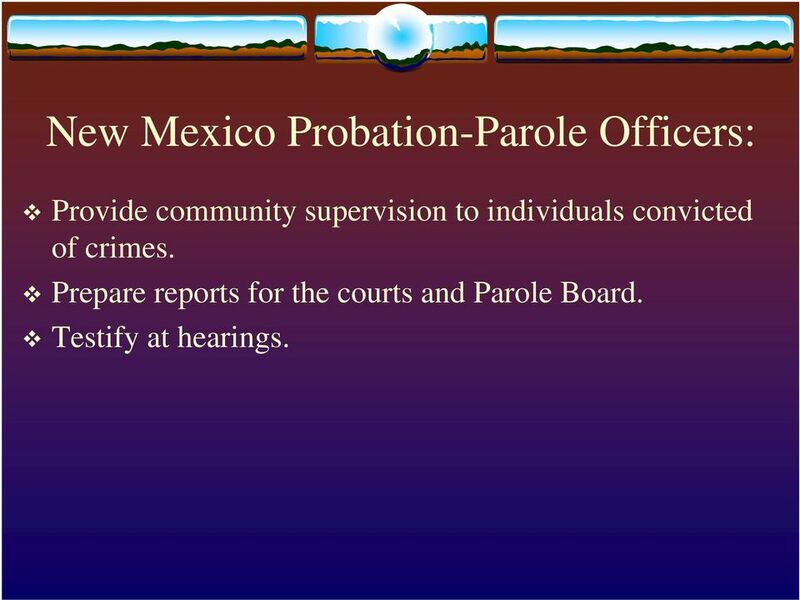 21 New Mexico Probation-Parole Officers: Provide community supervision to individuals convicted of crimes. Prepare reports for the courts and Parole Board. Testify at hearings. Refer individuals to treatment such as substance abuse, metal health, anger management, etc. Help probationers and parolees with employment, housing, health care access, transportation, etc. 24 If someone allegedly violates his or her probation or parole conditions: The Probation-Parole Officer can arrest the individual and Must tell the court or Parole Board about the alleged violation. 27 The reality is: Most people who go to prison do come home, but They face special barriers to reintegrating themselves back into the community. 28 The reality is: Most people who go to prison do come home, but They face special barriers to reintegrating themselves back into the community. These barriers include ongoing difficulties with substance abuse, problems finding work with a criminal conviction, problems finding housing, and family difficulties, among others. 30 NMCD tries to help people coming out of prison with: Getting connected with a community treatment provider. 31 NMCD tries to help people coming out of prison with: Getting connected with a community treatment provider. Acquiring ID cards and re-establishing disability benefits. 33 NMCD tries to help people coming out of prison with: Getting connected with a community treatment provider. Acquiring ID cards and re-establishing disability benefits. Accessing halfway houses or other affordable housing, and Identifying employers willing to give people a second chance. 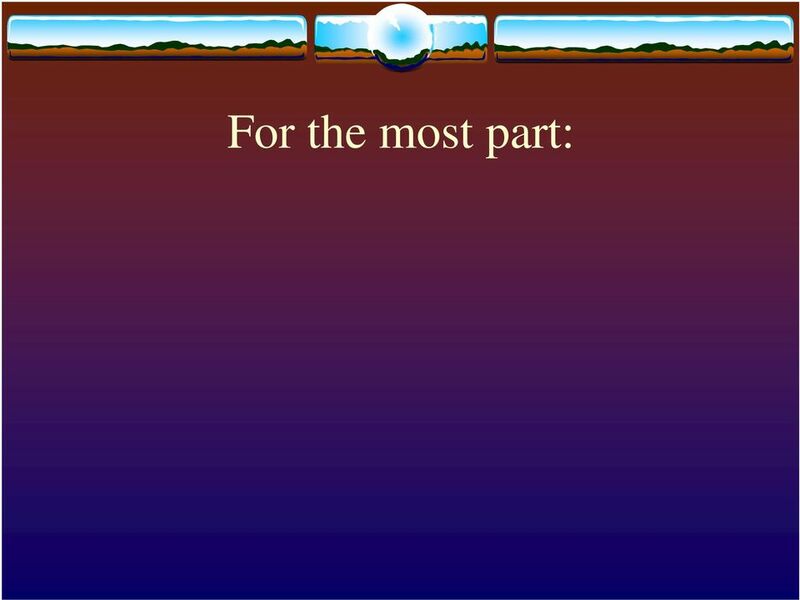 39 There are, however, multiple criminal justice agencies in New Mexico other than NMCD. These include: County Probation in Bernalillo County and some other areas, Federal (U.S.) Probation, Pre-trial services, Specialized Drug Court and Mental Health Court programs, and Community supervision by jails, among others. 42 NMCD is part of the Behavioral Health Purchasing Collaborative NMCD devotes considerable resources to treatment so people can learn the tools to stay clean and sober, and So people can access mental health care and other services that support their overall well being. 43 NMCD is part of the Behavioral Health Purchasing Collaborative NMCD devotes considerable resources to treatment so people can learn the tools to stay clean and sober, and So people can access mental health care and other services that support their overall well being. 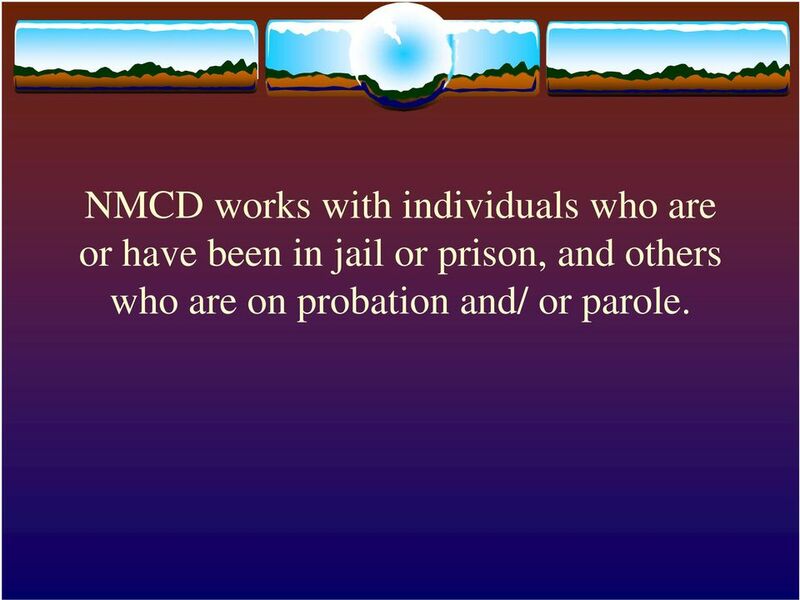 NMCD works closely with other Collaborative agencies to make sure probationers/ parolees are not forgotten and can receive behavioral health care services available to all New Mexicans. Texas Catholic Action Plan for Criminal Justice. Why is this needed?